Hey time flies without noticing it I have completed my AnleneMove 21 Day Habit Forming Challenge. Do you still remember that last month I pledged to Keep Moving & Keep a Healthy Lifestyle. Yes! I did it and it’s not burdening at all because I set my own pace and realistic goals. I should give myself a pat on the back, perhaps a little reward would be better. Today, I am going to share about how this mobile app facilitate my fitness goals and my experience using it. Have you ever set your resolution to exercise at least 3 times a week but along the way you slacked then forget about it. And you are back to your old bad habit. Hmm… have you ever ask why you slack? Is it because there is lack of motivation or no guidance or you are bored or there is nothing to facilitate your goals? Back to basics, I kicked start my 21-Day challenge at one of morning fun run event with friends; it’s a wonderful and memorable start. It’s always good to exercise with friends and family because not only we encouraged each other but also it’s a healthy bonding time. They say that it takes 21 days to form habit and it’s proven that highly successful people have learned to develop good habits and it takes discipline, courage and hard work on a daily basis to keep those habits in place. It makes perfect sense to adopt habits that will help us to achieve our goals, yet why are some so difficult to adopt? Always set a realistic goal for ourselves, don’t be too ambitious at the beginning. When we have achieved it then we will move to the next level and set a higher goal. This will helps us to have the sense of accomplishment and achievement. As you know when I started this challenge my left ankle was on the recovery path. I set my goal to walk 30 minutes in morning at least 3 times a week around my housing area before I head out to work. Plans help us to set goals so that we have a sense of achievement when we are able to carry out our plans successfully. With hectic and busy schedule we always complain that we don’t have time for exercise. I think that is just an excuse. I plan my schedule once I get used to the routine it will become something that I have to do, if not I will feel like something is missing or incomplete. Usually I have more time during the weekends so I make sure that I go for my morning walks with friends or family on saturday and sunday and then one of the weekdays. Nothing come easy, all we need it is determination and consistency for the first 21 days. When health is our priority there is no compromise, so just do it and it will be a habit. If possible have an app or something that can help us to facilitate our fitness routine and goals. This will gives us a measurable overview of our performance and how we can improve it further. 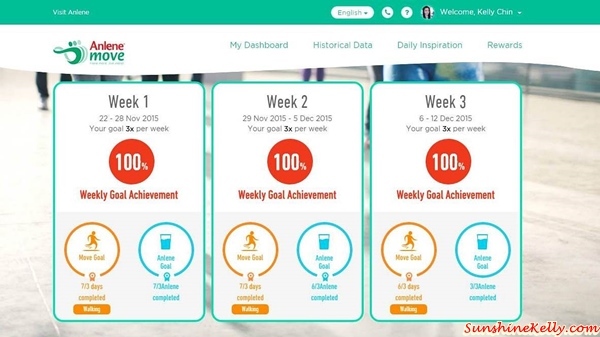 I have been using the AnleneMove App to facilitate my exercise and keep track my fitness goals. The mobile app is user friendly and it inspires me to workout according to the goal I have set. I think I exceeded my goals hehehe… instead of 3 times a week I did more. After using AnleneMove mobile app for my 21 Day Habit Forming Challenge I find exercise 3 times a week has become part of my routine. If I don’t go for my morning walk I feel that something is missing. Hey one more thing I discovered, not only I have formed a habit of exercise but also I am used to wake up early nowadays. Automatic 630am I will wake up and get ready for my morning walk even though it’s on weekends. This is one of the good sign. Besides, exercise regularly I also incorporate taking Anlene product on daily basis. Usually I will drink a glass on Anlene milk before I head out for my walk. Please remember to eat something before exercise to fuel our body so that we don’t feel like fainting or passing out. Then at night 3 hours before I sleep I will drink a glass of warm milk. I love the Anlene Concentrated on the go, whenever I don’t have time for breakfast or I feel that my energy level is running low I drink it. The helps to provides 4 times calcium compared to the regular fresh milk. The AnleneMove app also helps me to monitor the amount of Anlene I consume daily. Consume more calcium-rich food such as milk, cheeses, other dairy products and certain vegetables is good for our body. As you know that calcium is important for overall health and well-being, almost every cell in our body uses calcium in some way. Our body use calcium for muscle contraction, transmitting messages through nerves and release of hormones. If we don’t consume enough calcium in our diet, our body will take calcium from our bones to ensure normal cell function. This can lead to weakened bones or calcium deficiency. Overall, AnleneMove mobile app did make some positive impacts on my lifestyle, not only I formed a good exercise and waking up early habit but also began to consume more calcium-rich milk. The app also serves as a reminder for me to Keep Moving and Keep a Healthy Lifestyle, whenever I ate a heavy meal I will try to burned of those calories. Now I feel more energetic and can focus better to accomplish my daily tasks. I will continue to use this app to facilitate my fitness routine and goals. Hey! Remember that I did a giveaway of 5 units of Anlene Hampers worth RM150 each. After going through the list and entries we have finalized that these are the 5 winners. Drumrolls… Here are the winners for AnleneMove App Keep Moving & Keep a Healthy Lifestyle Giveaway. Congratulations to all the 5 winners. Kindly response and email to your full name and contact number latest by 11th Jan 2016 to kelly2988[at]gmail[dot]com with the subject AnleneMove Giveaway. We will arrange the prize collection; if you required to courier the prize, the postage fee is bear by the winner. All the prizes must be collected by 31st Jan 2016 if not it will be forfeited. For those who did not win please don’t give up, do continue to exercise and use the AnleneMove app. 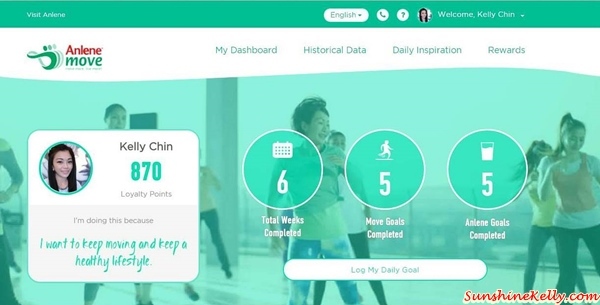 Because you can collect Loyalty Points and redeem cool stuff when you login your workout, Anlene consumption and also Anlene product purchase. Thank you so much dear! So happy! Congrats to all winners! My mom loves anlene too! congrats to all winners!!! anlene is good.. I must admit that getting into and maintaining a fitness program is one of my challenges. Your post reminds me that I really have to start it now. I'm more inspired to make this year a healthy one. Congrats to all the winners! Time to keep myself healthy for this new year! Interesting about the 21 days. So it takes that long. We really need to push ourselves if we are to create positive habits. What an awesome app to have to keep track of your fitness! These are definitely important when you want to switch to a healthier lifestyle. Congrats to all the winners. I want to stay healthy too. I actually do believe that it takes 21 days to change habit. But it does sound easier said than done! Anlene is a famous brand for calcium building and ladies even in Singapore! I'm not sure if 21 days is enough to form a habit, but I will definitely try and see if it does! 21 days can really start you off with a good habit. 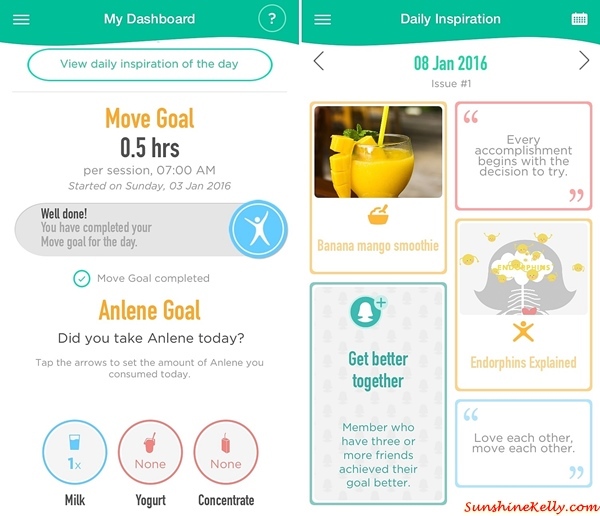 The Anlene app is great at monitoring your progress with your goals. Congrats on having a great start and a commitment to fitness. Getting fit has always been a yearly goal for me. Haha. I guess it's high time to get serious and sweat it out to stay healthy. Looks like a good app. Esp. when it comes with a range of health products it is indeed good. I have the RunLog app that measures the distance & speed I run everyday! Definitely you need to give it a good shot to form natural habits. It is great to have an app for added motivation, I will have a look for that. Heads up for trying and doing things to achieve your goal. you have valuable tips here! congrats to all the winners. I am sure you enjoyed the 21 days challenge Kelly.